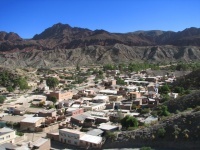 Located in Potosi Department, Tupiza mining town serves as a popular base for tours of nearby San Vicente, which is the region's major drawcard. San Vicente's 'Wild West' history features Butch Cassidy and the Sundance Kid: two of the world's most famous outlaws. Both of them died in Tupiza after fleeing the US in 1901. They were gunned down by the Bolivian army. Organised tours from Tupiza lead tourists along the 'death trail' of Butch and Sundance, giving visitors the chance to follow the outlaws' last days. The trail leads all the way to their supposed final resting place.